Lowrance part # 106-62. 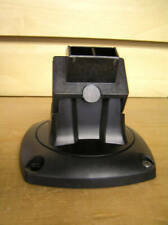 This item is new includes transom mounting bracket and instructions. Fits all 2003 and newer Lowrance and Eagle 200 kHz sonar units with black "D"connectors. 20' cable. LOWRANCE ELECTRONICS. LOWRANCE ELECTRONICS. Bracket for Mark and Elite models. Includes mounting screws. Quick Release Bracket. Part # 2011365. These parts are new, direct from the manufacturer. MINN KOTA MOTORS. This part also fits the Minn Kota MKA-16 Quick Release Bracket. LOWRANCE ELITE-7 Ti2 COMBO W/ ACTIVE IMAGING TRANSDUCER, US/CANADA NAV CHARTPLOTTER FISHFINDER. The combination of Active Imaging 3-in-1 Sonar featuring CHIRP, SideScan and DownScan with FishReveal, allows you to see structure and cover with a new level of refined detail and at a range unmatched by any other structure-imaging technology. Trending at $749.88eBay determines this price through a machine learned model of the product's sale prices within the last 90 days. Mounting a HOOK² Bullet or SplitShot transducer to the transom of a boat is easy with the Bullet/SplitShot Transom Mount Bracket. LOWRANCE ELECTRONICS. BULLET/SPLITSHOT TRANSDUCER BRACKET. 5003 University Av. LOWRANCE ELECTRONICS. It will not support the transducer. Power Cable. 5003 University Ave NE. A Minn Kota Authorized Service Center. PRODUCT VENDOR: LOWRANCE. CONDITION: NEW. We are proud to carry a large selection of new and pre-owned inventory. At Augusta Marine “service after the sale” is not just a catchphrase, it’s our reputation! Cable Length 6m (20ft). The connector is a 5 pin. New, never used, what you see is what you get, no mounting hardware included, just the transducer. Trending at $65.00eBay determines this price through a machine learned model of the product's sale prices within the last 90 days. LOWRANCE ELECTRONICS. NEW Lowrance25FootExtension cable fits all 2007 and newer, Ethernet-enabled Lowrance units with 5-pin yellow connector. Compatible with most HDS systems. 25foot Ethernet Extension Cable. Lowrance hook2 7 spiltshot ,in good working condition and good cosmetic shape ,includes unit,splitshot HDI transducer ,and power cord. Does not include mounting bracket and knobs. Fits all Lowrance Elite-7 models. Eco Friendly Marine ReCycling. and things just stop working (it's a Used Marine Part in Most cases). To the best of our knowledge. We have other parts coming in daily. Item is for sale on other site locations as well. TOTALSCAN SKIM 6ft M-H 455/800. The TotalScan transducer features multiple mounting options and is fully compatible with displays featuring integrated StructureScan HD, like Lowrance HDS Gen3, Elite-7 Ti, Elite-5 Ti, Simrad NSS evo2, and NSO evo2. 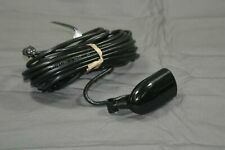 HOOK2 Power Cable •Power cable for 5" 7" 9" 12" Lowrance HOOK2 Series units. Trending at $17.91eBay determines this price through a machine learned model of the product's sale prices within the last 90 days. LOWRANCE ELECTRONICS. Transducer Mounting Bracket. Includes the mounting hardware. 5003 University Av. Minneapolis, MN 55421. LOWRANCE ELECTRONICS. The Lowrance Point-1 is the ideal position and heading device. In addition – unlike other position-only antennas – the Point-1 provides heading for accurate boat direction at any speed and for radar/chart overlay. Lakeside Marine & Service is a Minn Kota Authorized Service Center. Lowrance 000-10782-001 Literature Download Owners Manual. Link-2 is a feature-rich, floating handheld VHF radio that is Class D DSC compliant and features Man Over Board functionality and storage for up to 300 waypoints. Lowrance TA-400 Adapts Lowrance or Eagle Transducers with black connectors to Lowrance or Eagle sonar units with gray connectors. Just plug it in and fish. Yes, it's that easy. Product Depth: 3.31" / 84 mm. Product Width: 6.51" / 165.3 mm. Backlighting Levels: Adjustable Screen And Keypad. Display Type: WVGA color TFT LCD. Easy front-dash or quick-release bracket mounting installation - Pick the best installation option for your boat from simple flush-mount and quick-release-bracket installation options. This item is new. LOWRANCE ELECTRONICS. Link-2 is a feature-rich, floating handheld VHF radio that is Class D DSC compliant and features Man Over Board functionality and storage for up to 300 waypoints. The Link-2 is full Class-D DSC enabled VHF. SimNet to N2K Adaptor Kit - Connect Simrad heading sensor (FC40, RC42) to. T connector. Original Lowrance LEI TS-2U 99-77 Temperature Sensor. Temperature sensor fits all 2003 and newer Lowrance and Eagle products with temperature display capability and a black sensor connector. At QuickyBay we are committed to protecting your privacy online. Fits Mark and Elite DSI & HDI Transducers. LOWRANCE ELECTRONICS. Includes the mounting hardware and instructions. Part: 000-10262-001. Boat part number 1064559 is a NEW, in the box, boat fishfinder / depthfinder from Lowrance, part number 000-10751-001. Elite-4X model. The Elite-4x is a dedicated standalone fishfinder that comfortably fits the tightest spaces and budgets for finding fish, structure or great diving spots. Manufacturer: Lowrance. Lowrance 9-Pin to 7-Pin Adapter Cable. The Lowrance 000-12571-001 uses this cable to adapt a transducer with a 9-Pin black connector to a legacy 7-pin blue connector unit. Adapter Cable. 2 safe from dirt and debris with a Lowrance Sun Cover. Sun Cover f/Hook. Normalized SKU: 00014175001. I am selling a Lowrance Go Free WIFI-1 wireless basestation, part number 000-11068-001. It is new in the package (opened for pictures) and comes as shown in pictures. The basestation measures roughly 5 1/2" inches long x 2" inches wide overall. The black cable measures roughly 40 1/2" inches long and the grey cable measures roughly 6 1/2' feet long from tip to tip. The mounting bracket on the backside measures roughly 6 3/4" inches long x 1 1/2" inches wide. For more information regarding this item contact a dealer in your area. ( BW / 15C / 9066535 ) (8) Shipping is for the continental United States only. For shipping outside of the continental United States, please inquire about shipping cost before bidding. The SonicHub2 is compatible with Android and IOS devices. Sonichub®2 Marine Audio Server and 6.5" Speakers. Pair of 6.5" Speakers. Audio Server. Included in Box. Integrated support for Pandora® Internet Radio when connected via a smartphone or tablet with the Pandora app. Link-2 is a feature-rich, floating handheld VHF radio that is. The Link-2 is full Class-D DSC enabled VHF. This marine radio has. Handheld Class D DSC-compliant Marine. "Get Buddy" feature transmits radio position option. LOWRANCE ELECTRONICS. PD-WBL In-Hull or Trolling Motor Transducer. Trolling motormount, or shoot-thru-hull, wide cone angle, 200 kHz "Pod" type transducer. Fits all 2004 and newerLowrance200 kHz sonar units withblue connectors. Fuel Flow Sensor with 10' cable & T-connector. Fuel Type: Gasoline only. The Fuel Flow Sensor does not operate diesel engine fuel systems. Fuel Flow Sensor Gasoline ONLY. 1 required per engine. Up to 3 engines supported. X47, X47EX, X-50 DS, X-57TX X67C, X-86 DS, X96. Lowrance/Eagle PD-WSU puck transducer. Lowrance part # 106-59. This item is new. Includes instructions and factory warranty. LOWRANCE ELECTRONICS. Trolling motor mount or shoot-thru-hull, wide-angle, 20 degree pod type (200kHz). TotalScan Transom Mount transducer. The TotalScan transducer features multiple mounting options and is fully compatible with displays featuring integrated StructureScan HD, like Lowrance HDS Gen3, Elite-7 Ti, Elite-5 Ti, Simrad NSS evo2, and NSO evo2. 2 4x Fishfinder. 7-Pin Adapter Cable to. transducer to HOOK. TotalScan All-In-One Transducer. LOWRANCE ELECTRONICS. Compatible with Lowrance Elite-7Ti and Elite-5Ti. Transducer has a plastic mounting bracket. Transmit Power N/A. LOWRANCE ELECTRONICS. Lowrance 2' extension cable. Minneapolis, MN 55421. 5003 University Ave NE. A Minn Kota Authorized Service Center. HDS series. DEPTHFINDER FOR A MASTER CRAFT BOAT. NOT SURE OF THE YEAR. PLEASE CHECK WITH A DEALER BEFORE BUYING. THIS HAS NOT BEEN USED. 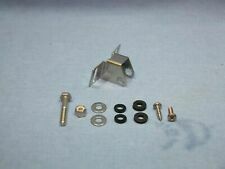 MASTERCRAFT PART NUMBER 509129 FOR THE GAUGE. This knob screws into the side of your fishfinder to attach the gimbal mounting bracket. LOWRANCE ELECTRONICS. 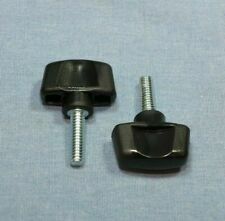 For use with the following Lowrance Gimbal Knobs - Pair. GEN2 TOUCH. HDS GEN2 TOUCH MODELS. Yamaha 4-Stroke 50-250 | 2-Stroke HDPI 150-350. Digital trim must be connected by a Yamaha dealer. Engine Hours. Engine Temperature. UPC: 042194529820. 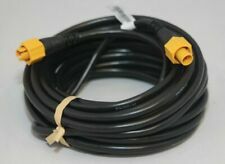 Boat part number 1020400 is a new extension cable cord from Lowrance, part number N2KEXT-2RD. Part Manufacturer: Lowrance. Features (2) connection ends with, (1) 5-pin male connector and (1) 5-pin female connector.